If I had/hadn’t V3, Subject + would/wouldn’t + have V3. B. Contoh Dialog Bahasa Inggris Expressing Regret. B: I’m so sorry, I wish I could come to your birthday party, but my father had come (past perfect) to visit me before I went. So I couldn’t go. did Jack come? A: yeah, but I he went home when we were singing together (past continous) because his mother was sick. B: I am so sorry to hear that. was the party cool? A: yes, we had been singing together for 3 hours on my backyard’s home when finally rain came fall down. B: well, next year I must come to your birthday party bro. A: Ok, I will be glad. D: Where is our kid John? E: Didn’t they with you all day? D: Oh, my God. I told you to care of him since I had to take cake in the oven for a while. I should have not leave him. hiks..
E: I’am so sorry, but I didn’t hear clearly what you say to me. I was busy with my job. Hmm, I ought have finished my job yesterday. D: Then what are you waiting for? find him now!! E: Ok, just calm down. I’ll find him. 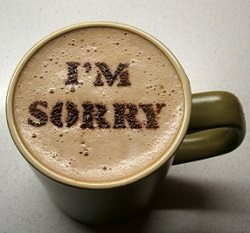 Demikianlah penjelasan tentang pengertian dan Contoh Dialog Bahasa Inggris Expressing Regret. Semoga membantu dan jika menurut kamu tulisan ini bermanfaat, mohon sharenya melalui tombol Like atau dengan meninggalkan komentar di bawah ini. Terima Kasih. Tagged contoh, dialog, expressing, inggris, penyesalan, regret. Bookmark the permalink.